The One or The Many? | The Utilitarian Undertone of OITNB Season 5. | | Quiet Lunch. The One or The Many? | The Utilitarian Undertone of OITNB Season 5. 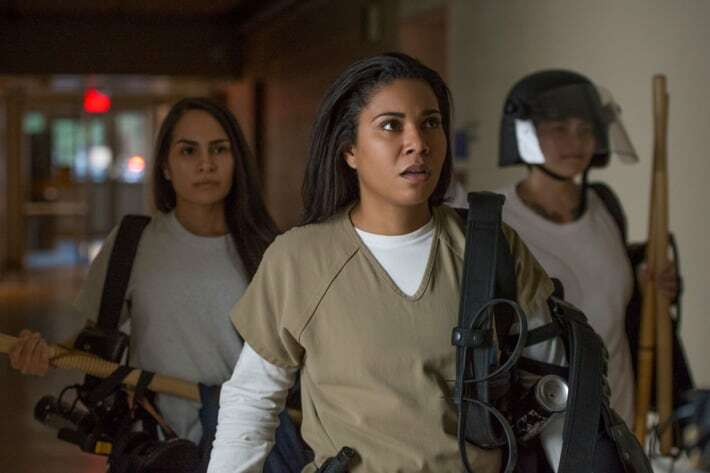 With its fifth season having only debuted just under a week ago, everyone and their binge watching mama is raving about Orange is the New Black. 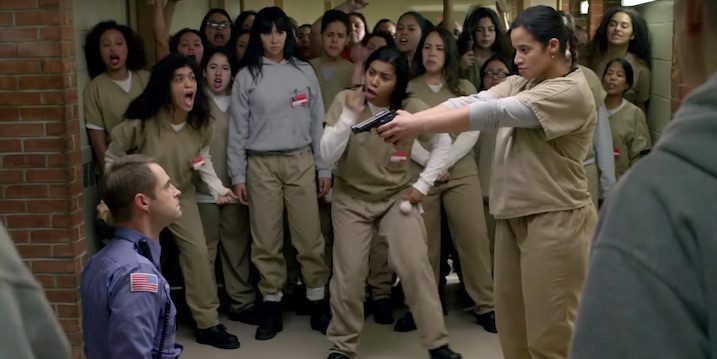 The latest season picks up where the last season so teasingly left off: Dayanara (portrayed by Dascha Polanco) pointing a gun at CO Thomas Humphrey (portrayed by Michael Torpey) as a majority of the other female prisoners yell and scream for her to shoot him right there on the spot—SPOILER ALERT, she eventually does. Daya gives Humps his comeuppance. Speaking of spoiler alerts, there will be a lot of those in here, but this isn’t a recap of season 5. Instead we are examining the season’s philosophical undertone; an undertone that focuses on an ongoing existential dilemma that we constantly face, not just as individuals, but as a society. What is that existential dilemma? Utilitarianism. For those who may not be familiar with utilitarianism, it is an ethical theory that is often unbiasedly in favor of the majority or the greater good. It can also get a little deeper in which the result of the act is primarily considered or the rule of the act is primarily considered. Too vague of an explanation? Of course it is. Think of it like this: you and five of your friends are binge watching OITNB and you decide to order a pizza. It’s time to choose the toppings and you and one other friend want anchovies and pineapple—because you both do not have souls—and your other four friends want prosciutto and broccoli rabe because they have pretentious palates; and they all agreed that they do not want anchovies or pineapple anywhere near their pizza. Well, if you all weren’t pinching pennies, you could simply order two pizzas; but you only have enough money to buy one pie. Another solution involves the two topping teams fighting each other to the death—but who is willing to lose their lives over pizza? Do not answer that question. Fortunately utilitarianism cuts straight to the chase and avoids all the bloodshed—majority wins and you and your other weirdo friend can partake in the pizza despite it not having the toppings you wanted or you can both kick rocks with no socks. That’s right, because four out of six in your group of friends want prosciutto and broccoli rabe and only two of you want that other disgusting combination (by now you should be able to tell that I am totally team prosciutto and broccoli rabe), you guys are ordering a prosciutto and broccoli rabe pizza; because the many should not have to suffer simply because a few want it their way. It would be the same result if it was the other way around, even if someone was allergic to one of the toppings. A more textured example would include the one Piper (portrayed by Taylor Schilling) described in the episode aptly titled “Tied to the Tracks”, when the group were faced with the decision of turning in Dayanara in exchange for amnesty. In a nutshell, Piper’s example went a little something like this: there’s a train coming, all of sudden you discover that there are five people tied to the tracks and you don’t have time to untie them all. You can pull a lever that switches the train over to another track but you then also discover that there is one person tied to that track. Do you do you nothing, let things take its course and let the train kill five people or do you knowingly take one life to save five other lives? What counts more, “the right and wrong of actions the actions themselves or the right and wrong of the consequences of those actions”? Alison Abdullah (portrayed by Amanda Stephen) quickly stated that she would pull the lever. Zirconia (portrayed by Daniella De Jesus) even referenced the utilitarian theory by agreeing with Abdullah and stating, “She’s utilitarian. I’d pull it, too”—which led to some introspection and me asking myself the same question: would I let the train stay on track or would I pull the lever? Much like Abdullah, I quickly chose the latter. But the introspection didn’t stop there. I brought the question to Quiet Lunch Headquarters and almost unanimously everyone chose the latter. Then I decided to add some nepotistic bait to the mix: what if the person you pull the lever to kill was your mother, father, brother, sister, son or daughter—would you pull it then? Hesitation ensued and the answers naturally got complicated. 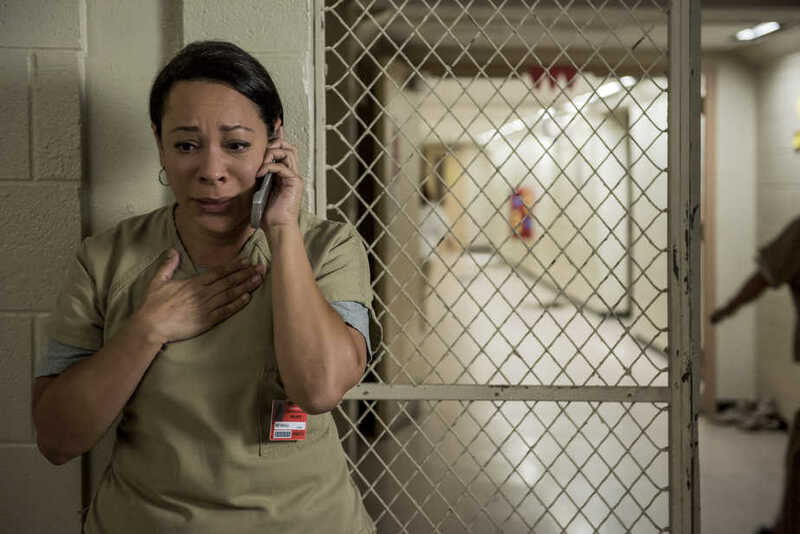 As for OITNB, things got more than complicated when three characters from the main cast, Taystee (portrayed by Danielle Brooks), Gloria (portrayed by Selenis Leyva) and Maria (portrayed by Jessica Pimentel), were faced with the same dilemma in their own right; and in the end, they all made the wrong decision. They chose to let the train stay on track and, ironically, that is when things at Litchfield went off track. 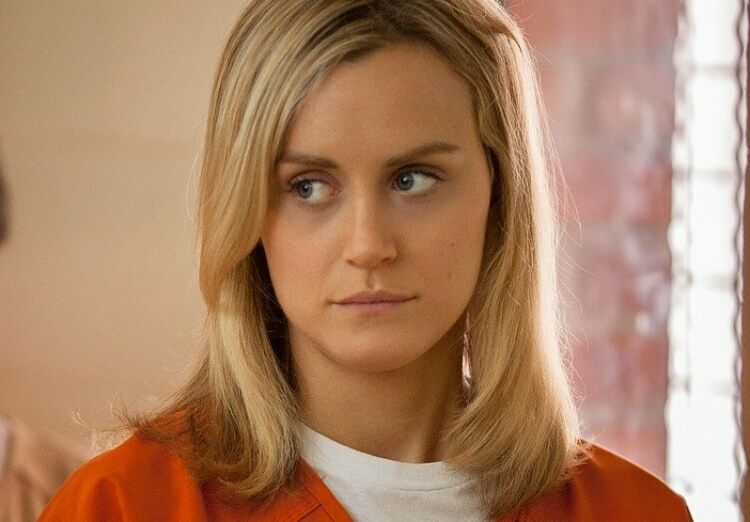 Taystee, partially through ego, coveted justice for Poussey over the demands of her fellow Litchfield inmates. Gloria, although conflicted while doing so, chose to deceive her fellow inmates in order to be granted furlough so that she can see her son who was in Intensive Care after being beaten within inches of his life. Maria, the only character who kind of got what she wanted despite her selfishness, even gave a cutthroat “pep talk” to a then tormented Gloria about not owing anything to any of the fellow prisoners, she even called Gloria “brave”—only to steal Gloria’s plan, undercutting her, and release the hostage herself in hope for an early release so that she may finally get to see her daughter who she has had little to no contact with. All of these decisions contributed to and resulted in a catastrophic conclusion in which CERT stormed the prison and brought a violent and degrading ending to a riot that, while unruly at times, had so much promise when the inmates were united, organized and focused on the greater good that is prison reform. Gloria finds out her son is in the hospital. Maria is out for self. Oddly enough, Dayanara, the least mature of the inmates, was the only main character who managed to make the right decision by choosing to hand over her daugther, Armaria, to Pornstache’s mother, Delia Powell (portayed by Mary Steenburgen), and turn herself in for shooting Humphrey so that negotiations would resume and her fellow inmates would be granted amnesty. Dayanara proved herself to be the true utilitarian in the end. Utilitarianism, at first glance, may seem like a cure-all—especially when it comes to choosing pizza toppings—but when applied on a sociopolitical or socioeconomic level, it can become a painstaking process of logic and morals. We are living in an age where the few (the haves) are making the decision for the many (the have-nots)—and the few aren’t necessarily making these decisions with the many’s best interests in mind. It is a reoccurring phenomena, an irremovable thorn in the side of modern civilization. The theme of applied ethics in OITNB’s latest run cleverly mirrors the current environment of our modern society and does so in dramatic fashion. Our rectification of inequality, especially in regards to class, culture and economics, has been a long drawn out process that has taken decades, centuries and ages to play out; and the writers and the producers did a splendid job of capturing that lengthy struggle in one tumultuous, thought provoking season. 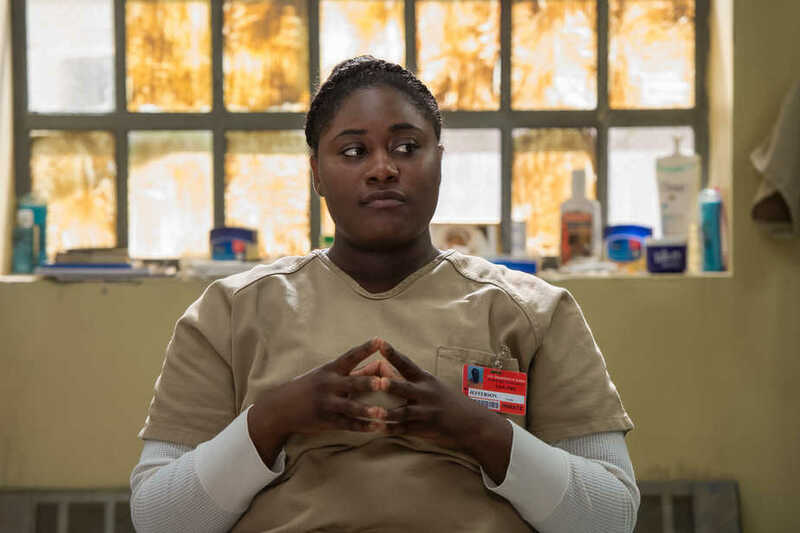 The fate of the inmates at Litchfield Penitentiary hangs in the balance until Season 6 but in the meantime, the show leaves us asking ourselves: would I have done it any differently? Would I have sacrificed justice for Poussey in order to fulfill the needs of the all the other inmates? Would I have passed up the chance to be furloughed so that I could be by the side of my firstborn who may not even make it out of the hospital alive? Would I have been willing to miss my first child’s formative years to make a stand against a private prison complex that has been destroying family for decades? Would you have sacrificed the needs of one for the needs of many?